Ireland’s international life sector had its best ever year in 2014 according to statistics compiled by Insurance Ireland and released to Finance Dublin. 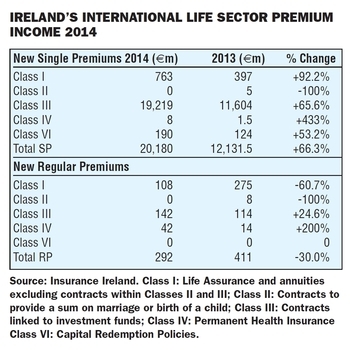 Total new premium income reported by Insurance Ireland members was €20.5 billion for the year compared with €12.5 billion in 2013, an increase of 63%. According to Ajay Pathek of Insurance Ireland there were a few changes in the companies included in this year’s statistics and that just including the same companies as last year would show an increase of about 36%, still impressive growth. Last year the II members accounted for about two thirds of the total market and it will be interesting to see how the whole sector performed when the Central Bank issues the ‘Blue Book’ data later in the year (last year it was published in September). Insurance Ireland has not released data by company yet but it is clear the growth is centred on the Italian market, now by far our largest. In 2014 Italy produced new premiums of €15.2 billion compared with €8.1 billion the previous year, although some of this increase may be accounted for by changes in the companies included. The UK was in contrast unchanged at €2.9 billion. The growth was also entirely in single premium business, with regular premium business, already the small relation, actually down from €412 million to €292 million, a fall of 30%. The drop in regular premium business occurred mainly in Spain, UK, Italy and Portugal.